Jogging is a great way to get some exercise, and it can be even better when you have a companion to do it with. I’ve been seeing a lot of people taking their dogs along, but I haven’t seen anyone jogging with a Shih Tzu. This begs the question... can you jog with a Shih Tzu? As it turns out a Shih Tzu does not make a good jogging companion. They just aren’t built to run very far or very fast. In fact, you may only get a few minutes of jogging before this short-legged dog starts falling behind. Also they are a brachycephalic breed, which means they have narrowed nostrils and partially obstructed airways. Because of this, breathing may become difficult when doing strenuous activities. However, if they are young and healthy and have a lot of energy, a half mile may be possible. Although it will be more like a combination of walking and light jogging instead of a steady pace. As mentioned above, jogging can be quite hard for this little dog, yet he does need some exercise to stay healthy and strong. If you’re a beginner like me, you may be fine jogging short distances at a light pace. This can be a good way to get some exercise and spend some quality time with your Shih Tzu. But keep in mind as with any high energy workout, you need to consider your dog’s health. And is very important to make sure he is physically capable of this type of activity before you begin. So before launching into this activity with your dog, take him to visit with his Veterinarian. Let them know of your plans to begin jogging with your Shih Tzu, and have them to do a thorough health check. Once, your Shih Tzu has been giving the thumbs up from the vet, you can take him out for some exercise. Of course, there are some cautions to take when jogging with a Shih Tzu. Terrain. Because running has such an impact on a dogs legs, a softer terrain would be an ideal. A dirt path, or grass field is a great alternative to hard pavement. Weather. Shih Tzu don’t do well in hot temperatures. If it’s going to get hot out, schedule your work outs in the morning when it’s cooler outside. If it’s hot and humid no matter what time of day it is, you should avoid exercising this breed outdoors. Instead, see if you can locate a pet friendly air conditioned, indoor track. If not, avoid this activity until the weather is cooler. Watch for signs of fatigue or overheating as Shih Tzu are at risk for heatstroke. If your Shih Tzu suddenly stops, do not force him to continue running. If your dog appears overheated, get him to some shade and give him some cool water to drink. Don’t let him drink too quickly, as this can cause bloat. Pour some water over him to help him cool him down. If his condition doesn’t improve or worsens seek immediate medical help. Long or short coat. Shih Tzu are covered in hair which is there to keep him warm and protect his skin. But when he has a full coat, he’s going to get a lot warmer during any strenuous exercises. Imagine wearing an insulated coat while jogging…you're going to get very warm, pretty quickly. This is the same for your dog, except they can't take their coat off. Age of your dog. Older Shih Tzu may have joint problems that make running uncomfortable for them. With puppies, they are still growing. And running with them before their growth plates have fully formed can cause long term damage to his joints and bones. So it's best not to jog with your dog in these circumstances. There is a lot to consider when jogging with your Shih Tzu, and you have to wonder if it’s even worth the risks. But all is not lost. There is a way you can go jogging with your Shih Tzu, and still get a good work out for yourself. 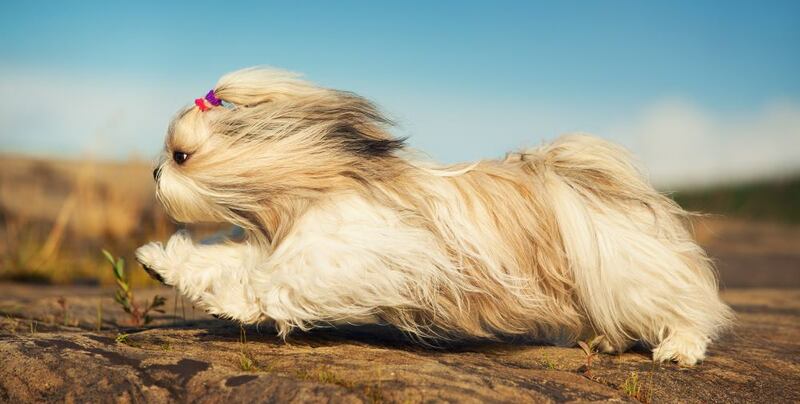 Okay you now know some of the reasons why a Shih Tzu may not be the greatest jogging companion. But there is a way you can take him on your workout while keeping him close by and safe and sound. If this sounds odd to you, think about it this way. Have you ever seen parents jogging while pushing their toddler in a stroller? A pet stroller is basically the same thing. This way you can get a complete workout in without having to stop every few minutes to wait for your little buddy to catch up. Or let him run next to you for a little while and when he gets tired, put him in the stroller, then continue on with your work out. You may feel a little funny using a pet stroller for your dog at first, but it does have other advantages too. Your don't have to leave your Shih Tzu home alone, or find a dog sitter. Strollers have compartments you can store water, bowls, treats and other items needed. You won’t have to worry about an aggressive dog attacking your pup while he's walking or running beside you. Instead he will be up off the ground and won't be an easy target for a bully dog. If you have an elderly dog, or a dog that has an injury, a pet stroller is the perfect way to continue on your daily walks together. This is what we did for our dog Rocky when he was sick. He loved his daily walks, and with the stroller we were able to bring him around so he show off his chariot to his neighborhood pals. If jogging with a Shih Tzu is beginning to sound like too much work, there are always other activities you can do with them. Jogging can be a little too strenuous for this toy breed. Yet, they do still need to get exercise to keep the healthy. Here are just a few activities you can do with a Shih Tzu. Play fetch. This is a great activity. Not only will he be getting some daily heart healthy exercise, he will love it because he thinks its a game. 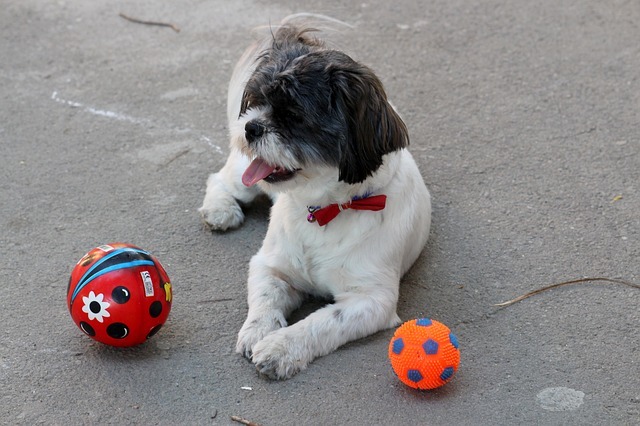 Shih Tzu like to chase their toys, or a ball. Walking. 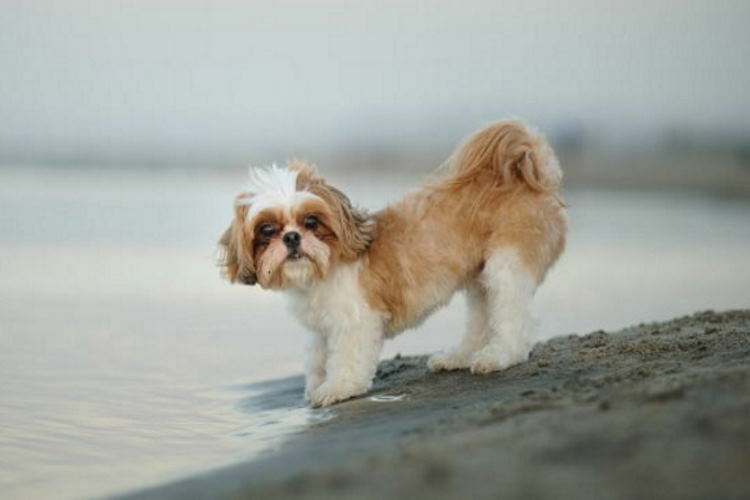 This is one the of easiest ways to exercise with your Shih Tzu. You can do it pretty much anywhere, and it is very low impact. Hiking Through The Woods. Shih Tzu can do well hiking a couple miles through the woods, as long as they stay well hydrated and take breaks as needed. Swimming. If your Shih Tzu likes water, this is a fun activity. And if your dog has some arthritis in his legs, it's an excellent low impact exercise. But, you will need to keep a very watchful eye on him. This is especially true is he is in a full coat, it can easily get waterlogged and pull him under the water and drown. The ocean current will be too strong for this little dog. Your local swimming hole will be better option. If you decide to try this activity, I recommend getting a doggy life jacket for him. One that has a handle on the top so you can help keep him afloat while he swims. Playing with other dogs. It's adorable when you watch your Shih Tzu playing with other well behaved dogs isn't it. He's getting some great exercise chasing them around, plus he's learning how to socialize. Some pet stores will have "playtime" classes. Or call your friends with dogs and schedule play dates. A local dog park is good too, but you need to be extra vigilant in spotting potential dog aggression. Bike riding. With this activity, your Shih Tzu can sit in a basket on your handle bars, or in a pet trailer attached to the back of your bike. He won't get much exercise this way, but will enjoy the ride and just being with you. No matter what activity you decide to do with your Shih Tzu, remember to always bring lots of water so he can stay hydrated. Also have treats on hand to reward him for his good behavior. Ease him into the activities slowly, so he gets used to it, and then add a bit more time. A Shih Tzu is a low energy breed, so just 30 minutes a day of walking is all they really need to be happy and healthy, anything extra is a bonus.